Garden windows generally refer to kitchen and greenhouse windows that often face the backyard or garden. Most are designed to provide a touch of the outdoors to your interior by providing spaces right across the window sills where you can display potted flowering plants and decorative collectibles. They generally have four-sided glass panes around the wind that extend or jut out from a window opening similar to a bay window but on a smaller scale. The styling contains a glass panel on each side, front and a slanted top pane, allowing the most light to get through. The design also allows you to have a single glass shelf layer across the middle of the window. Depending on the styling, any of the four glass panes can be opened. Some garden windows have an awning, while others have side openings and front sliders. And like any window, their frames can be made of vinyl, wood or aluminum and also come in various sizes and framing colors. There are also DIY garden window kits that allow homeowners with DIY skills to install one themselves. For centuries since the Roman times to medieval Europe and colonial America, kitchens have been dark dingy dirty rooms with ovens and furnaces reserved only to servants. Often situated in basements, kitchens were the most unattractive place to be in a home. While the early 20th century saw electricity providing more kitchen conveniences, it was not until the mid 20thcentury when the modern kitchen with its ergonomic and aesthetic features started to become fashionable and the garden window became a kitchen feature for the modern American living. Hinging on the philosophy that the best quality work happens in pleasant work spaces, the kitchen has become a showcase of form and function where garden windows figure prominently. While there is no design or legal mandate that garden windows be used for the kitchen, they have become the design standard adopted by homeowners and those planning to build their first homes. Kitchen garden windows often placed along the kitchen sink and tops provide an airy spacious feel and the maximum natural lighting in the most confined working space in the house. Every state has numerous window providers specializing or carrying garden windows in their inventory. Some have national distribution reach where their products are made available in such stores are Home Depot. Among the better choices include Remodel USA Inc., which carry several brands like Owens corning Solace garden windows for East Coast residents and Window World, Inc., considered the largest windows replacement company. Make a shortlist of suppliers of garden windows carrying the size, color and styling you want and call each one for price estimates. You should also decide whether you want a DIY window kit or be installed by professionals. Check out the warranty. Most reputable suppliers carry lifetime or 50-year limited warranties against factory defects as well as being transferable to new homeowners in case you decide to sell the house later on. How much do Garden Windows Cost? You can get a 34″ x 36″ vinyl garden window with clear glass for a little over $1200. If you get grey glass or tempered glass %10-%15 will be taken off the final cost. A window of the same size and glass clarity with an aluminum frame will cost about $200 more than the vinyl. See How Much You Can Save On Garden Windows Today! 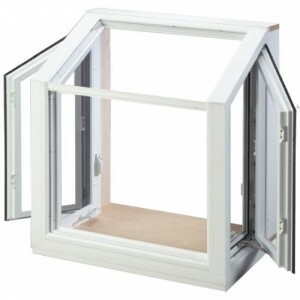 Prices of garden window products differ according to type, color, size, and features. Thus, it is necessary to compare prices of various garden window brands and to put products side by side in order to see the pros and cons. Therefore, the price of the end product you will get is dependent on your careful selection and inspection.